3000+ Member-only PETS, WEAPONS & ITEMS --- Access Exclusive areas, stories and boss battles --- Create and run your own Guild --- Access Member-only servers --- 20+ Member-only Classes (Including Paladin, DoomKnight, Renegade & more!) --- Special emotes, 2 free magic keys a month, Dual Wield, Unlock Chat, and much more! Every month there is a new bonus item package for AdventureQuest worlds. Visit the Upgrades page on the AQ.COM web site to learn more. 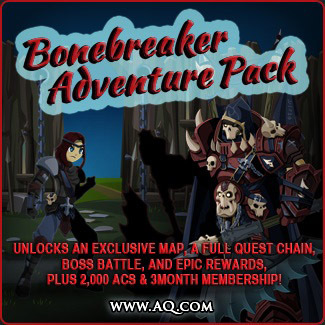 Bonebreaker pack unlocks the Bonebreaker Fortress map, quest chain, merge shop, daily quest, and boss fight plus 3 months membership and 2000 AdventureCoins! We would like to thank everyone who made AdventureQuest Worlds possible. We released a real, honest to goodness massively multiplayer game that plays in your web browser! To all of you who believed in us.... THANK YOU! For Parents upgrading their child's account: Please note, by upgrading your under-13 child's account, your child will be able to register with, and make posts on, the Artix Entertainment Message Board. While it is against our rules to post personally identifiable information on our forums and our Moderators enforce those rules, it is possible for your child to do so. Thus, if you would prefer that your child does not have access to the Message Board, please contact us after the upgrade to block your child from using the Message Board. Once again, thank you so much. It is because of you that this game is possible. We hope that you enjoy this brand new MMO, and that you love all the surprises that we have in store for you!